Fan Pier Public Green is the main pedestrian open space linking the neighborhoods of Boston’s Seaport District to Boston Harbor. As high winds are frequent in this location, Richard Burck Associates investigated strategies to celebrate and respond to this unique harborfront condition. The firm’s work produced a family of custom furnishings that draws from site context to support today’s uses. Of these custom fixtures, the Wind Bench can be seen as the primary component of site furnishing throughout RBA’s work within the Seaport District. Underpinning the design of RBA’s waterfront landscapes is an analysis of environmental conditions and a desire to engage the user with their surroundings. The most obvious challenge involved strong, consistent winds from the harbor through the project site. As a screen element, solid barriers do little in the way of shelter. In fact, they can actually increase wind turbulence by forcing wind gusts to rise and fall quickly over the screen. Windbreaks that are partially porous can be used to create a shelter effect on a screen’s leeward side. RBA detailed the Wind Bench with this in mind, spacing the wood slats to diffuse the flow of wind while allowing some to pass through. 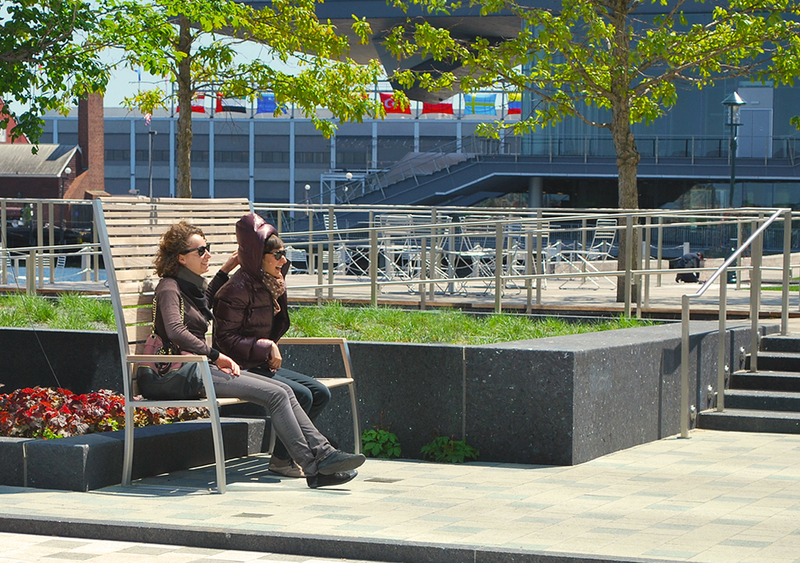 The Wind Bench is the most prevalent custom site feature in the Fan Pier streetscape. Located in each of the parks and along Fan Pier Boulevard and Marina Park Drive, the Wind Bench is a high-back seat made from stainless steel framing with ipe slats – marine-grade materials that will withstand the site’s coastal environment. RBA developed multiple iterations of this bench working with the furniture manufacturer Landscape Forms. The finished product is now an integral part of the harborside family of related furnishings. 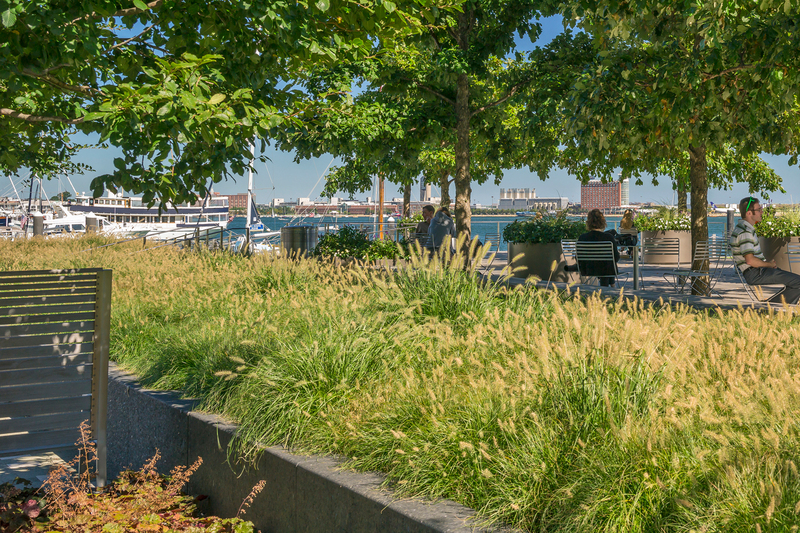 At Fan Pier Public Green the bench is complemented by tall perennial grasses to highlight movement in the windy environment. In heavy gusts the wind bench becomes a sheltered alcove, adjacent to the display of swaying grasses. 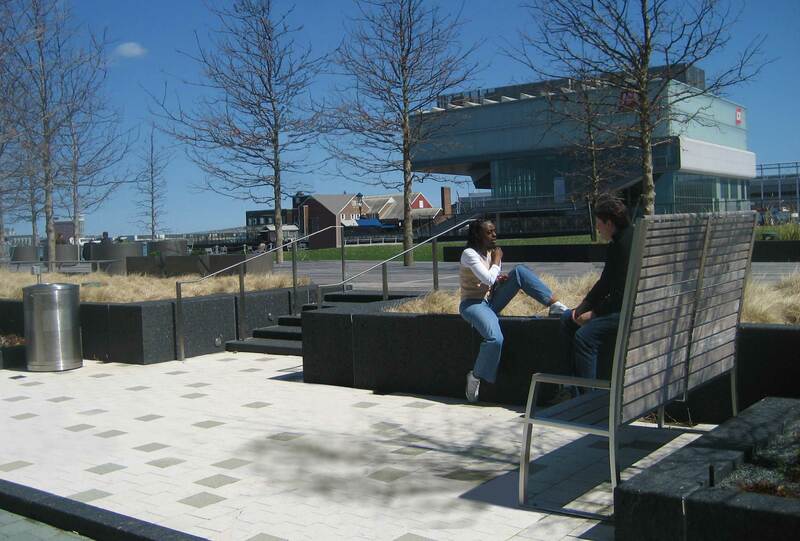 At Fan Pier Public Green, the Wind Bench is sited along dark stone seat walls that are warmed by the sun on a cool day, both elements responding directly to the site’s environmental challenges.